the face of a stranger’s baby. of my own ghost baby. on the roads of desire. into the shape of a fetus. 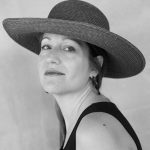 Sonia Greenfield is the author of three books: Circus Gravitas (Finishing Line Press), Boy with a Halo at the Farmer’s Market (Codhill Press), and American Parable (Autumn House). She lives with her husband and son in Hollywood where she edits the Rise Up Review and directs the Southern California Poetry Festival.